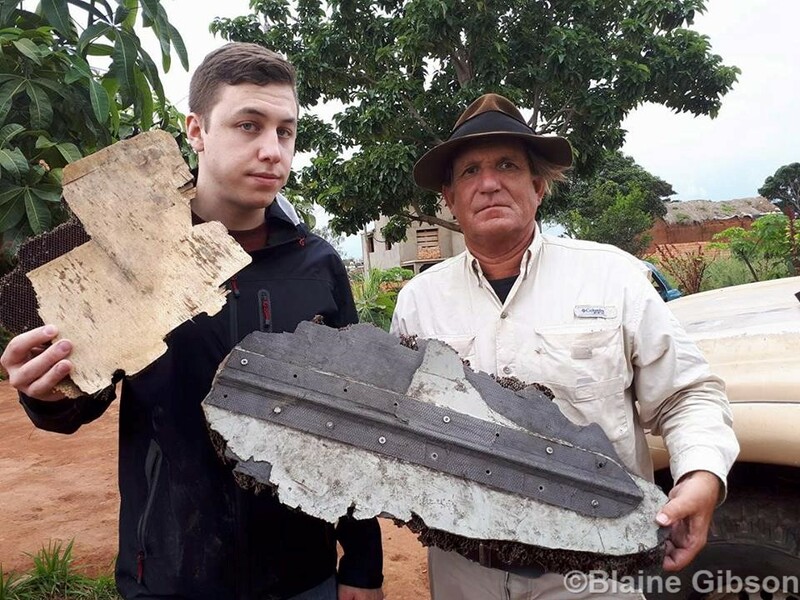 Blaine Gibson (right) and Nick Connite (left) in Madagascar with two new pieces possibly from MH370. 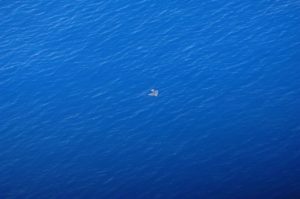 In a newly released report, private investigator Blaine Gibson reveals details surrounding two new pieces that could be from MH370. The pieces were discovered by residents of Madagascar in September 2016, and delivered to Malagasy authorities on August 16, 2017. Blaine writes that “for the protection of those involved, we decided not to make this report public until the debris was safely delivered to Malaysia.” That transfer was supposed to occur imminently. 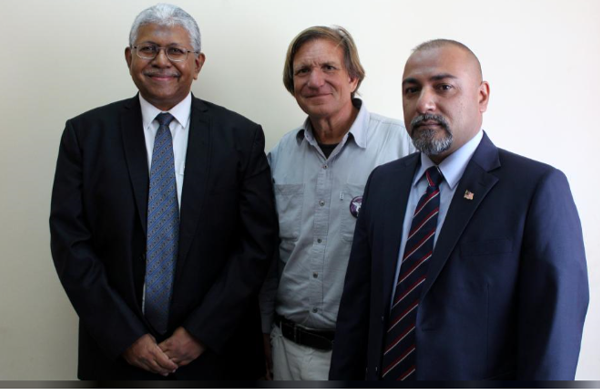 However, with the assassination of Hon Consul Zahid Raza, who served as a diplomat for Malaysia in Madagascar, the transfer has been delayed, and Blaine has decided to now release his report. Although not mentioned in the report, Blaine told me that during a trip to Madagascar, death threats were made to him and others for continuing to collect debris related to MH370. Blaine told me about these threats when I met with him on August 3, which was three weeks before Mr Raza was assassinated. The link between custody of the debris and the slain diplomat was first discussed in a previous post. Twenty-seven photographs of the two pieces are available for download. Of the two parts, the larger one was found on Maroantsetra Beach on Antongil Bay in September 2016. Blaine estimates the dimensions to be about 27 inches long, 12 inches wide, and 2 3/4 inches thick, and composed of a composite honeycomb structure. However, there is a 3 1/2-inch strip attached with fasteners that have not yet been identified as aviation related. The two new pieces. The smaller piece (left) is more likely from an aircraft than the larger piece (right). The smaller part was found on Antsiraka Beach around September 2016. Blaine estimates the dimensions to be about 12 inches long, 12 inches wide, and 3/8 inches thick, and composed of a composite honeycomb structure. This piece appears to have a higher possibility of being aviation related. The pieces remain in the custody of Malagasy officials until new arrangements are made to transfer the pieces to Malaysia. 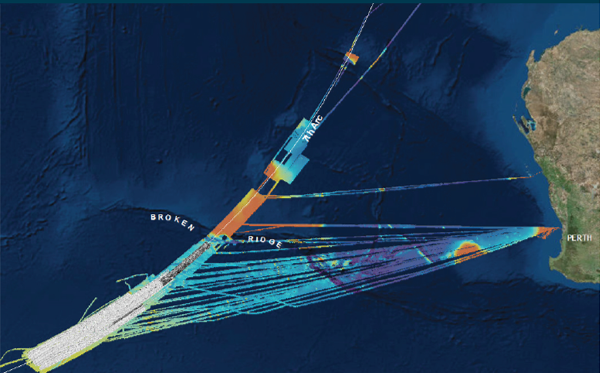 Blaine also has released new maps that show where it is in Madagascar that MH370 debris is predicted to wash ashore. The maps were created using computer models developed by Dr Charitha Pattiaratchi of the University of Western Australia. Blaine acknowledges that Dr Pattiaratchi and CSIRO’s Dr David Griffin have helped guide search efforts. 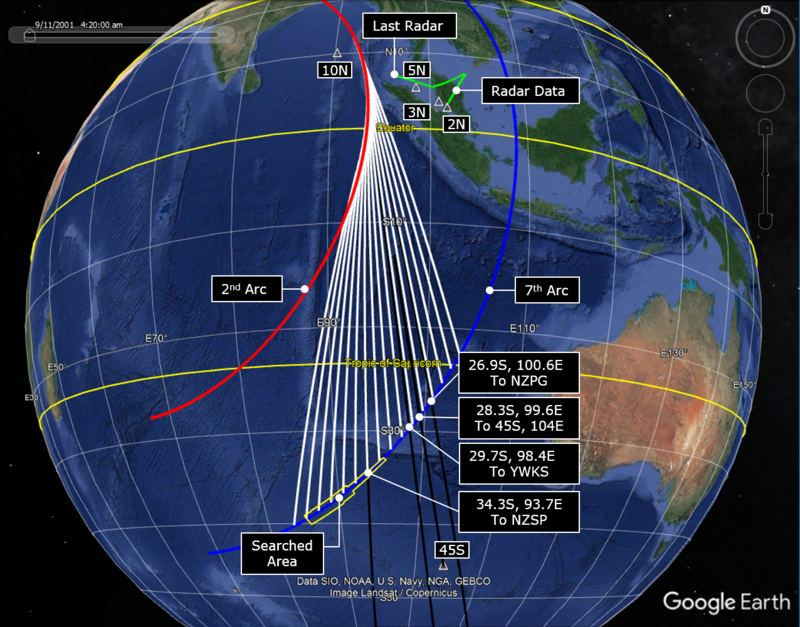 Location of MH370 debris as predicted by computer models (white) and where two new pieces were found (red). The new report, debris photographs, and maps are available for download as a collection of files. Update on Aug 29, 2017. The fasteners on the larger of the two pieces have been identified to be aviation related. Thank you to Annette Mansfield and Mike Exner for that information. On August 24, Zahid Raza, serving as the Malaysian consul to Madagascar, was killed in the Malagasy capital of Antananarivo. According to reports, he was shot multiple times while seated in the driver’s seat of his car. Mr Raza is reported to be of French-Malagasy nationality. Last December, Reuters reported that Mr Raza assisted Blaine Gibson in transferring the custody of pieces believed to be from MH370 from Madagascar to Malaysia. At that time, six pieces were transferred. This has raised questions as to whether there was a link between those MH370 parts and Mr Raza’s death. 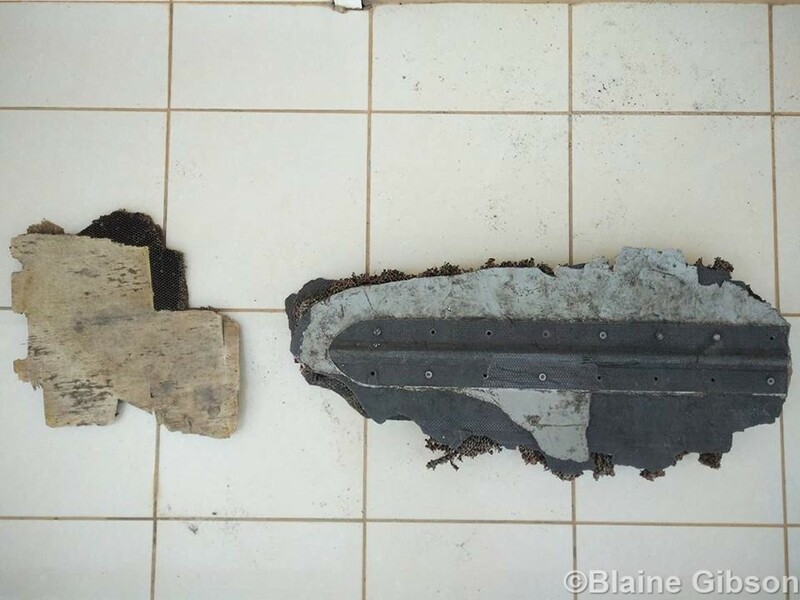 On August 16 possible MH 370 debris was handed over to Madagascar authorities, and authorities in Malaysia were notified. Under the agreement between the two countries, debris is supposed to be collected by Hon. Zahid Raza, the honorary Malaysian Consul in Madagascar, and delivered by private courier to Malaysia. On August 24 the Hon. Zahid Raza was assassinated in Antananarivo. At first we did not know if he had picked the debris up before this tragedy. 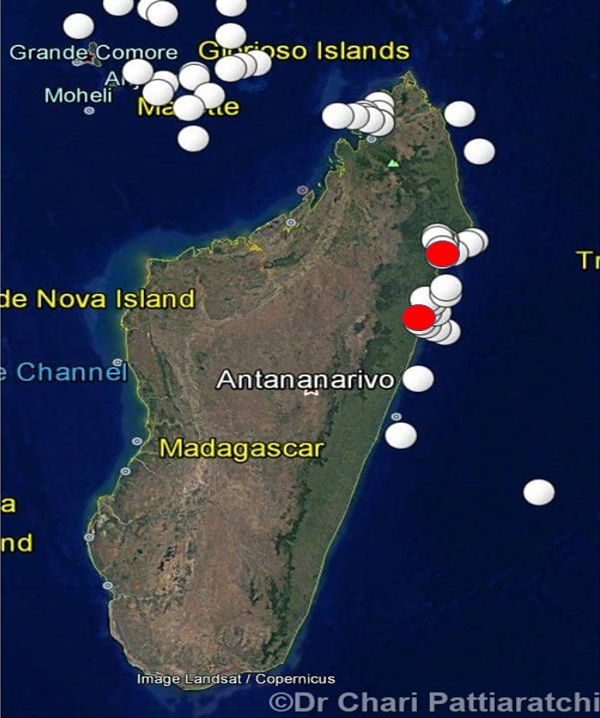 We just learned that the debris is still safely in the hands of Madagascar authorities. However new arrangements must be made for the collection and delivery of debris. Our thoughts and prayers are with the family of the Hon. Zahid Raza. In the aftermath of Mr Raza’s death, there seems to be conflicting stories about his background. He appears to be of French-Malagasy nationality, with family living in France and in the French Reunion Island. In one report, he is referred to as the “former” consul, but other reports imply he held the title of Honorary Consul at the time of his death. There is a report linking Mr Raza to a group associated with the kidnapping of residents of Indo-Pakistani descent that are living in Madagascar. (Madagascar does not grant automatic citizenship to those born on Malagasy soil. As a result, some Indo-Pakistani residents are from families that have lived in Madagascar for over a century.) The association of Mr Raza with the kidnappers has not been confirmed, and could be disinformation. Hopefully, the facts surrounding this will surface. Surprisingly, the assassination of Mr Raza has been met with stony silence from both Malaysia and France, despite his ties to both countries. I join Blaine in expressing my sincere sympathy to Mr Raza’s family. 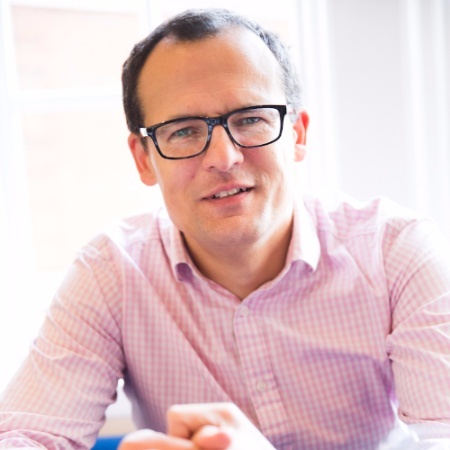 I had the opportunity to converse with Oliver Plunkett, who is the CEO of Ocean Infinity (OI). My goal was to learn more about OI’s offer to search for MH370 in the Southern Indian Ocean (SIO). Although Mr Plunkett would not disclose the details of the confidential negotiations with Malaysia, he did provide information that is helpful to understanding the general terms of OI’s proposal. First, OI’s offer is structured such that OI assumes 100% of the economic risk for the search. OI will NOT receive any payment if the wreckage is not found. So it would appear that if the success fee that OI is proposing is less than what Malaysia would have spent in conducting the search using conventional techniques, this is an extremely attractive offer. I learned a bit more about the recent sea trials that Ocean Infinity recently conducted in the North Atlantic. The tests demonstrated that the underwater autonomous vehicles (AUVs) could be successfully launched and recovered. Each AUV also demonstrated that it could independently scan the seabed. Mr Plunkett said he was pleased with the results so far. Further work is planned at deeper depths and over a wider range of conditions. Mr Plunkett also explained that although the unmanned surface vehicles (USVs) could not be used in the roughest of sea states, the search for MH370 could nonetheless occur over a wide range of conditions. This is because the mission is to scan the seabed and identify the wreckage rather than to generate precise maps. I inquired about the window of opportunity for completing the negotiations with Malaysia and starting the search. (We know from previous underwater search efforts that the search season in the SIO runs approximately from December to March.) Mr Plunkett is optimistic that Malaysia and OI will reach an agreement in a time frame that allows for adequate time to prepare for a search that begins this season. 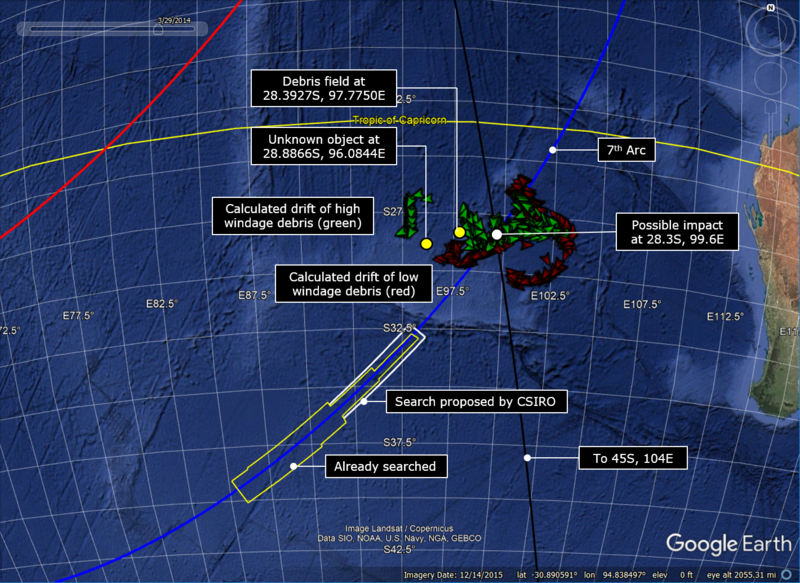 Finally, I asked whether OI had already determined the specific area to search. Mr Plunkett explained that OI intends to complement its internal resources with input from other organizations and other outside experts to help define the search area. 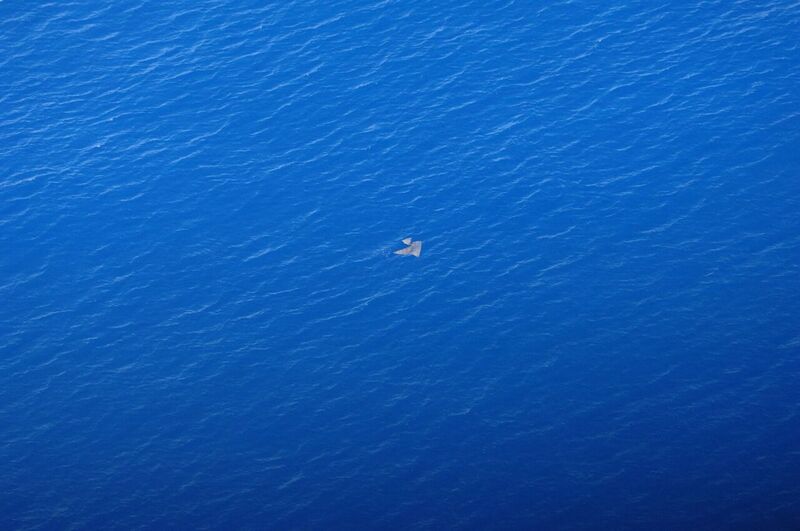 OI has already had some interaction with the ATSB, which he believes is completely committed to finding the wreckage. 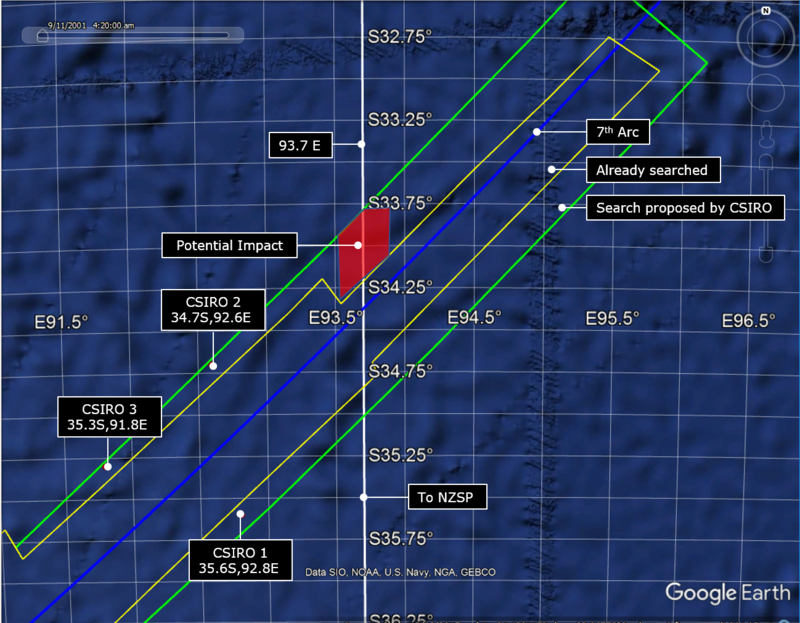 I don’t expect that OI’s search area will be very different than what we have been discussing here. Over the course of our discussion, it became apparent that Mr Plunkett was aware of the many posts and discussions that appear on this blog. 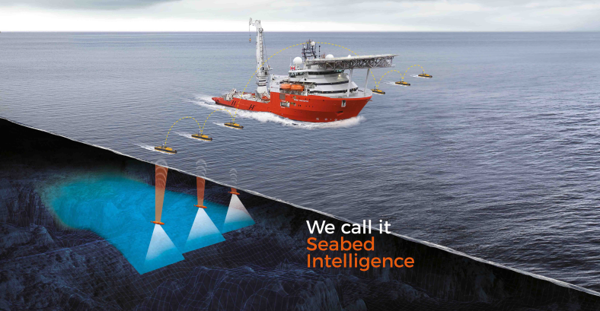 With such a favorable offer on the table from an innovative and qualified firm, I remain optimistic that the seabed search will re-start. However, for the search to begin this season, the window of opportunity to complete the negotiations is narrowing. It is imperative that Malaysia not miss this opportunity. In a story appearing the New Straits Times, Malaysia’s Department of Civil Aviation (DCA) reveals that the OI proposal to restart the subsea search is one of several proposals that are under review. The proposals will be brought to the attention of Australia and China for their views. 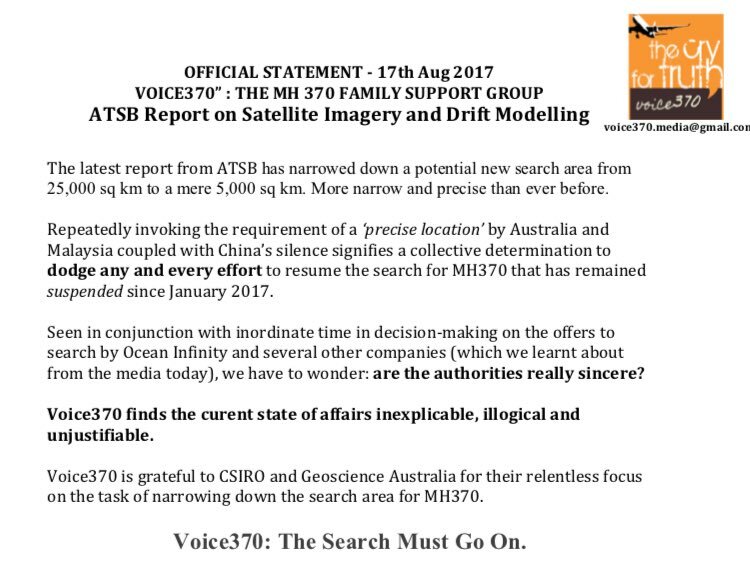 Voice370, representing the MH370 families, released this statement today which questions the delay in re-starting the search in light of the confidence expressed by CSIRO in identifying a probable impact site. Yesterday, a support group for MH370 families released a statement claiming that a private entity has offered to resume the seabed search for the aircraft with the understanding that it would collect a fee only if the aircraft wreckage was found. Today, through Grace Nathan, a Malaysian lawyer whose mother was a passenger on MH370, we learn that the private entity is a US-based firm called Ocean Infinity. Six HUGIN autonomous underwater vehicles (AUVs) are capable of operating in 6,000 m water depth collecting high resolution data at record breaking speeds. Our AUV fleet is accompanied by six unmanned surface vehicles (USVs) to ensure precise position and constant communication. With multiple autonomous vehicles working simultaneously utilizing innovative technology, we are able to survey huge swaths of the seabed, quickly and with outstanding accuracy. We can operate in shallow waters but excel in extreme depths, working in dynamic environments ranging from the tropics to the Arctic ice. Because of the size and complexity of each AUV/USV pair, the capital cost of the technology from Ocean Infinity would greatly exceed the capital cost of Virginia Tech’s technology, which uses small AUVs with innovative navigation systems. On the other hand, both approaches benefit from having a single host vessel supporting multiple underwater vehicles, which offers significant operating cost and scan rate improvements compared to the conventional towfish technology. Ocean Infinity’s seabed exploration system is commercially available today, including underwater and surface vehicles, on-board support equipment, and the host vessel. 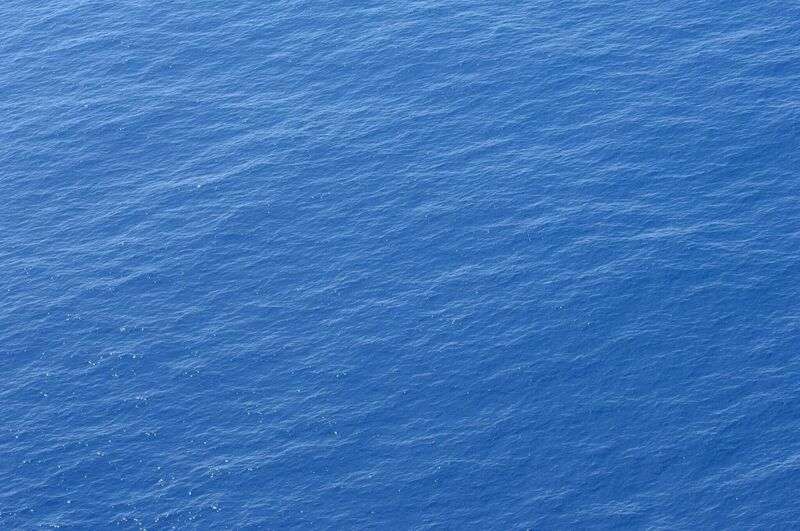 This is an exciting possibility for conducting the search for MH370 in the near future. I can now say that the “well-known ocean explorer” was David Mearns. At the time that I posted the article, I was not aware that Ocean Infinity had any interest in searching for MH370, although I was hoping they did. The prospect of exploiting Ocean Infinity’s technology in the near future is great news. That means that Malaysia, Australia, and China need to make a decision: Either the tri-partite countries should provide funds to re-start the search; or, the countries should fully cooperate with Ocean Infinity and other qualified entities that are interested in re-starting the search. Any other action is unacceptable. In a TV interview with Australia’s Studio 10, shipwreck hunter David Mearns reveals that he would like to mount a privately-funded search for MH370. 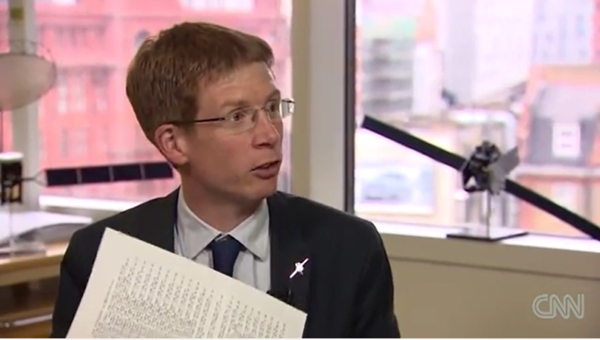 I should add that David Mearns has had extensive discussions and meetings with some members of the MH370 Independent Group (IG), in which many of our analyses and findings have been shared. I hope that collaboration continues. Last month, we published the complete logs for all communications that occurred on March 7 and 8, 2014, between the SATCOM unit aboard airframe 9M-MRO and the Inmarsat satellite network. (All times and days refer to UTC.) This includes communications before and during MH370 as well as the previous flight, MH371, between Beijing and Kuala Lumpur. Now that we’ve had a chance to investigate the logs for several weeks, I’ve summarized some of the findings. I’ve attempted to give proper credit to the individuals that worked on various aspects. If I have inadvertently omitted an individual, just let me know. Inference: The low (C/No) ratios at 18:25:27 and 00:19:29 were not likely due to abnormal aircraft maneuvers or attitudes. Inference: The multiple log-off and log-ons seen during MH371 are not indicative of a problem with the SATCOM. Inference: This increases the likelihood that the SATCOM was unpowered for an extended period of time prior to the log-on at 18:25, and increases the likelihood that the abnormal BFOs during the log-on at 00:19 were due to an increasingly high rate of descent. 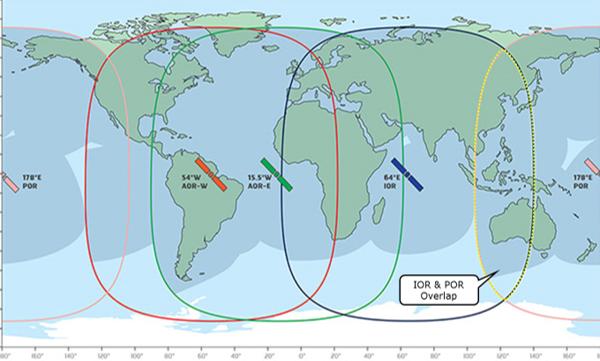 Inference: The corrected value of the BTO at 00:19:29 is 23000 – 4600 = 18400 μs, as previously suggested by Inmarsat. An adjustment to the position of the 7th arc does not seem to be warranted. Inference: The corrected value of the BTO at 00:19:37 is 49660 – 4*7812.5 = 18410 μs, which statistically agrees with the corrected value of 18400 μs at 00:19:29. Again, an adjustment to the position of the 7th arc does not seem to be warranted. Inference: If a serious condition had arisen during MH371, it would have generated an ACARS message. Therefore, no serious condition arose during MH371. Inference: This increases the likelihood that the IFE was unpowered prior to the log-on at 18:25 and unpowered prior to the log-on at 00:19. Inference: Since no log-off request was recorded prior to the log-ons at 18:25 and 00:19, it is likely that a power interruption preceded each of these log-ons. Inference: If there was no fuel rebalancing by a pilot, the right tank for MH370 would have run dry about 15 minutes before the left tank. 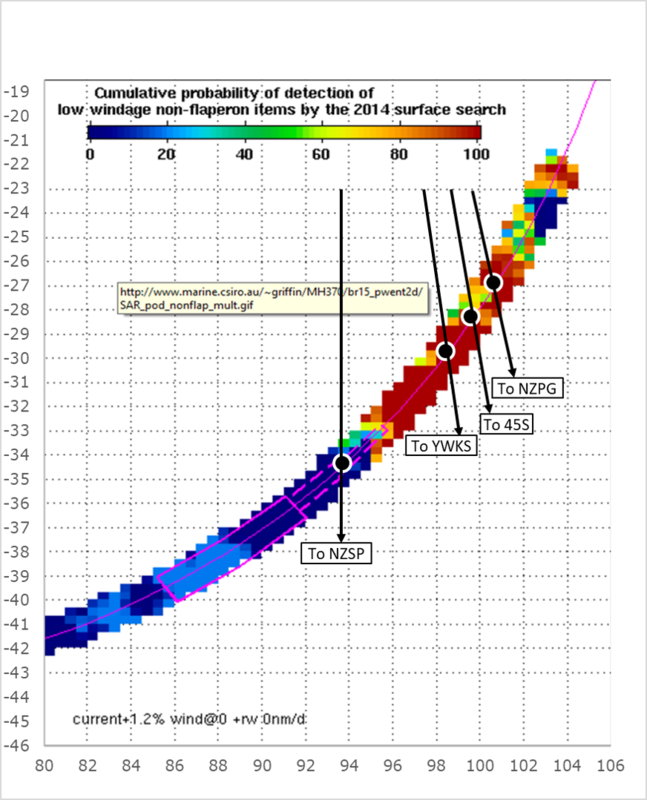 Inference: The measured values of BTO and BFO for MH370 can be used to disqualify hypothetical paths with predicted values of BTO and BFO that do not match the measured values, as the ATSB and independent investigators have assumed. 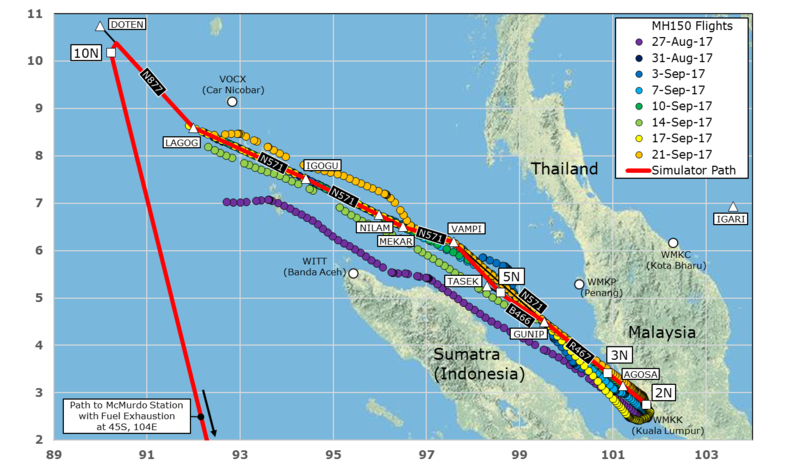 In summary, the previous flight MH371 seems to have been normal in all respects. Using the satellite data from MH371, we have a higher level of confidence that for MH370, power was interrupted to the SATCOM prior to the log-ons at 18:25 and 00:19, and also higher level of confidence that the aircraft was in an increasingly steep descent at 00:19. Considering that the newly available data generally supports the conclusions of the official investigators, it remains a mystery as to why Malaysia withheld the data for so long, and why it chose to release the data at this time. I hope everybody is enjoying today, the Fourth of July, including Americans celebrating Independence Day. Since we first learned of its existence, we’ve been asking for the complete record of the communications data between MH370 and Inmarsat’s satellite network. In May 2014, Malaysia released satellite data logs, but they were incomplete: fields of data were missing, and only a small number of data records from before the flight was made available. When pressed for the complete logs, Inmarsat and Malaysia both claimed the data had to be released by the other. We now have what we believe is the complete record of communications between airframe 9M-MRO and the Inmarsat satellite network, from March 7, 2014, at 00:51 UTC, until March 8, 2014, at 01:16 UTC. This time period includes the previous flight from Beijing to Kuala Lumpur. I suspect the data will confirm some assumptions, and will raise even more questions. I hope the data can help us learn more about the disappearance.